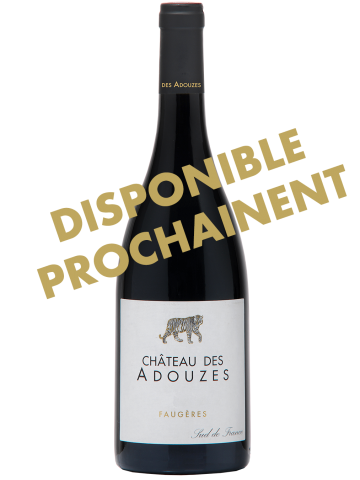 ORIGIN: AOP Faugères, South of France. GRAPES: 35% carignan,35% grenache noir, 30% syrah. WINEMAKING: Manual harvest at optimal maturity. Carignan is vinified with whole-cluster carbonic maceration in order to extract intense aromas and flavors. Syrah is vinified traditionally with destemming and 20-30 dauys of vatting. The wines ar aged in tanks for 12 months. Blending and bottling at the château. TASTING NOTES: Intense ruby red color. cassis and raspberry on the nose with hints of pepper ans spice. Good structure and smooth on the palate with fresh fruit flavors and balance. SERVICE: Drink within 3 years with roasted or grilled meats, barbecue or spaghetti bolognaise. Since the Middle Ages, Château des Adouzes sits overlooking a village Roquessels in the heart of the Faugères appellation. 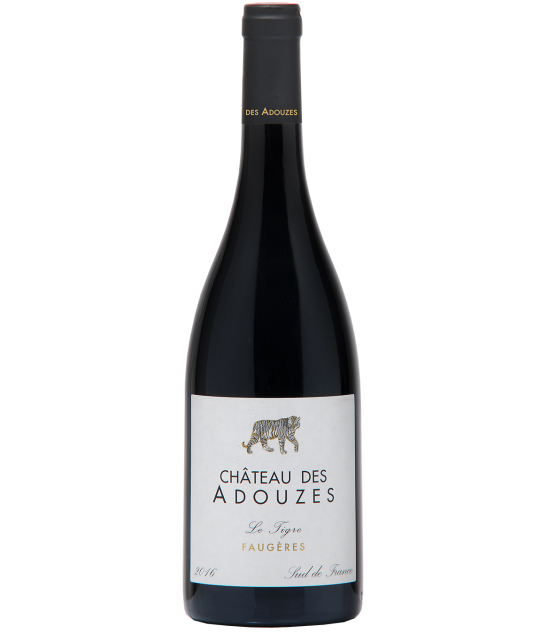 It is one of the best red wine area from Languedoc, South of France. The 42 Ha (100 acres) vineyard has primarily more than 70-year-old Grenache noir and Carignan vines. They thrive beautifully on this excellent schist terroir. The tiger symbolizes the power and balance of our wines. Some even speak of a sighting in the vineyard…!